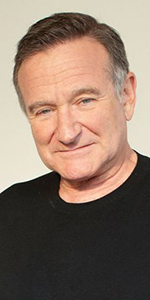 Robin Williams is the ever-manic comic sensation, who, making a huge splash on television, became a large draw at the movies. Growing older, his films moved in different directions, but always managed to showcase it star. Troubled by paranoia, he ended his life tragically short. Shy as a youth, Williams grew up in the well to do neighborhood of Lake Forest, outside of Chicago, then in a huge house in Bloomfield Hills, outside of Detroit, where his father was an executive with the Ford Motor Company. Taking an early retirement, the family relocated to Tiburon, in Marin County, outside of San Francisco when Robin was 16. Overcoming his shyness in the high school drama department, Robin enjoyed soccer and wrestling, becoming popular and being elected class president. Studying political science in college, he dropped out to study acting at the College of Marin, playing Fagin in the musical Oliver! Winning a full ride scholarship to Julliard in 1973, Williams was in a select master class taught by John Houseman, where his classmates were Christopher Reeve, William Hurt and Mandy Patinkin. His manic energy, ability with accents, and acting chops wowed everyone. But Robin's take on things did not suit the Julliard program. Dropping out in 1976, Williams returned to the Bay Area and worked as a busboy in a restaurant. He began performing as a stand-up comic at the Holy City Zoo in San Francisco, then relocated to Los Angeles, appearing at The Comedy Store and other clubs. He appeared in the ensemble sketch film Can I Do It 'Till I Need Glasses? (released in August, 1977). Williams became a regular on the re-boot of Laugh-In aired over NBC for six episodes from September, 1977 to February, 1978. He taped his first HBO Special, Robin Williams: Off the Wall, at the Improv in Los Angeles in October, 1978. Substituting for an actor who dropped out of the role, Williams made his television debut as Mork in an episode of Happy Days aired over ABC in February, 1978. The episode was so popular that it was spun off into another show. He co-starred with Pam Dawber in 94 episodes of Mork & Mindy airing over ABC from September, 1978 to May, 1982. Mork was everywhere. During that time, Robin won a Grammy Award for his Reality. . . What a Concept album in 1980; he would win it four more times. Williams made his big screen debut as the title character in Popeye (which World Premiered at the Chinese in December, 1980) with Shelly Duvall. The bizarre and expemsive film flopped. Williams fared much better in the film of The World According to Garp (released in August, 1982) with Mary Beth Hurt, and Moscow on the Hudson (released in April, 1984) with Maria Conchita Alonso. Robin Williams: A Night at the Met became a Grammy winning album and top-rated HBO Special, aired in October, 1986. Like all comedians, Williams was interested in trying more dramatic roles. His turn as a failed actor (!) in an adaptation of Saul Bellow's Seize the Day (released in May, 1987), went nowhere, but he bounced back in the popular comedy / drama Good Morning, Vietnam (released in December, 1987) with Forest Whitaker, and especially Dead Poets Society (released in June, 1989) with Ethan Hawke. Williams cotinued to make comedies with a dramatic tinge to them; as a car calesman in Cadillac Man (released in May, 1990) with Tim Robbins, starring as a doctor working with encephalitics in Awakenings (released in December, 1990) with Robert De Niro, played another doctor in Kenneth Branagh's thriller Dead Again (which played the Chinese in August, 1991), and played a homeless wackadoodle in The Fisher King (released in September, 1991) with Jeff Bridges. Williams finally got to play Peter Pan for director Steven Spielberg in Hook (released in December, 1991) with Dustin Hoffman, then did the voice for Batty Koda in FernGully: The Last Rainforest (released in April, 1992). Liking animation and working with children's material, he did the voice for the Genie in Aladdin (released in November, 1992), then enjoyed his biggest hit in director Chris Columbus's Mrs. Doubtfire (released in November, 1993) with Sally Field, and did a small role as a doctor (!) for Chris Columbus in Nine Months (released in July, 1995) with Hugh Grant. Williams starred in the hit film Jumanji (released in December, 1995) with Kirsten Dunst, then starred with Nathan Lane in Mike Nichols' remake of the French film La Cage aux Follies, The Birdcage (released in March, 1996), and starred as a prematurly aged fifth grader in Francis Ford Coppola's Jack (released in August, 1996) with Diane Lane. He took the part of Osric in Kenneth Brannagh's epic film of Hamlet (released in December, 1996), and starred in the remake of The Absent-Minded Professor, Flubber (released in November, 1997) with Marcia Gay Hamilton, scored another huge hit (and a Best Supporting Actor Oscar) playing a doctor (!) working with Matt Damon in Good Will Hunting (released in January, 1998), played the title role as doctor Patch Adams (released in December, 1998), which became another hit. 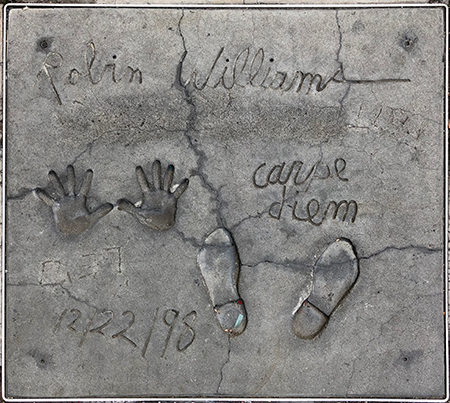 Williams finally landed on Broadway with Robin Williams: Live on Broadway for three perfs in early July, 2002, which was recorded, released on CD, won a Grammy, then was broadcast as an HBO Special in mid July, 2002. For once, and to great effect, Williams played a suspect in a murder case in Insomnia (released in May, 2002) with Al Pacino, and played Wilbur and Orville Wright and General U. S. Grant in four episodes of Freedom: A History of Us aired over PBS in February, 2003, and starred in the sci-fi thriller The Final Cut (released in October, 2004) with Jim Caviezel. He starred in the comic crime film The Big White (released in December, 2005) with Holly Hunter, and played a radio talk show host in the mystery The Night Listener (released in August, 2006) with Toni Collette. Williams did the straight-ahead comedy RV (which played the Chinese in April, 2006) with Josh Hutchinson, and in Man of the Year (released in October, 2006) with Laura Linney, he played a comedian who accidentally gets elected president of the U.S. Speaking of presidents, Williams played Teddy Roosevelt in Night at the Museum (released in December, 2006) with Ben Stiller, which became his biggest hit film ever. Williams did a 26 city tour called Weapons of Self-Descrtruction, ending in New York City in December, 2009, which was taped for airing on HBO. Then, a curious thing happened: Williams began starring in a string of low-budget "film festival" productions, interspersed with studio pictures. World's Greatest Dad (released in August, 2019) directed by Bobcat Goldthwait, and Shrink (released in August, 2009) with Kevin Spacey, were hardly released in the U. S., but Old Dogs (released in November, 2009) with John Travolta, got a wide release. Willams played a priest in the ensemble film The Big Wedding (released in April, 2013), and played another U. S. president — Dwight D. Eisenhower — in Lee Daniels' The Butler (released in August, 2013). He was ideal as an owner of an ad agency in 22 episodes of The Crazy Ones aired over NBC from September, 2013 to April, 2014. Williams committed suicide by hanging himself at his home in Paradise Cay on August 11, 2014. He was immediately cremated with the ashes being scattered across San Francisco Bay. He unreleased work slowly ebbed out: Boulevard (released in July, 2015) with Kathy Baker, The Angriest Man in Brooklyn (released in May, 2014) with Mila Kunis, his performance as husband to Candice Bergan in A Merry Friggin' Christmas (released in November, 2014) with John McHale. His final credit is for doing the voice of Dennis the Dog in Absolutely Anything (released in May, 2017) with Simon Pegg. Mann's Chinese Theatre, Hollywood, California. Robin Williams Forecourt ceremony, Tuesday, December 22, 1998. 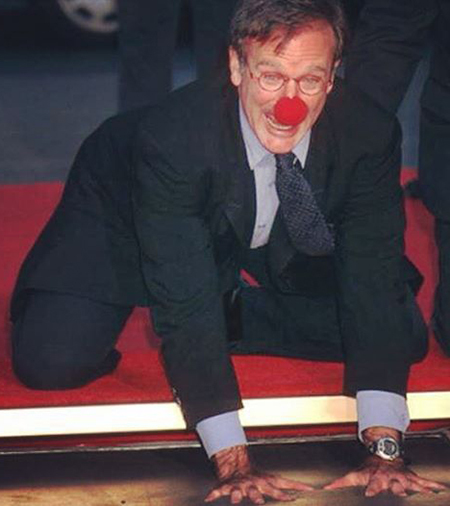 Robin Williams yukks it up while placing his hands in the cement.